Thirty years ago, a small group of friends came together to form a learning-in-retirement program that would later became OLLI. In their founding charter, they expressed their commitment to building a volunteer-driven program in which older adults could keep learning and stay connected. This fall we celebrate 30 years of lifelong learning, having built upon the early visionaries’ work to become an organization of 1,200 members age 50 and better, who enjoy more than 300 peer-led classes, seminar series, and seasonal social events annually on a wide-variety of subjects. 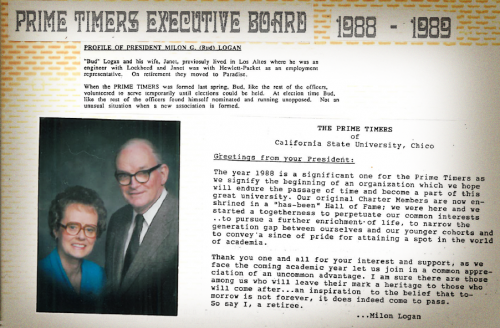 In the spirit of our founders and of Prime Timers’ first president, who envisioned that our organization would “endure the passage of time,” we are launching the Milon “Bud” Logan Lifelong Learning Campaign to ensure that OLLI can continue to serve adults in Chico and surrounding communities. Our goal over the next three years is to raise $100,000 through donations and leadership gifts. This fund will create a reserve that is critical to the long-term sustainability of this program and allow us to expand the variety of programming that makes the OLLI experience rich. There are several ways you can help us celebrate 30 years of lifelong learning at CSU, Chico and achieve our campaign goal. Every gift and every dollar counts. Can we count on you to be a Logan’s Hero? Give today!